Experience Skytron operating room and hybrid room configuration designs in virtual reality using smartphone VR with Google Cardboard at ACE Summit 2018. Minneapolis, MN- February 14, 2018 Axonom, a global provider of visual and virtual product configurator software, today announces Gold Sponsor Skytron is unveiling a smartphone virtual reality exhibit in partnership with Axonom at ACE Summit and Reverse Expo in Atlanta, GA, on February 18-21, 2018. 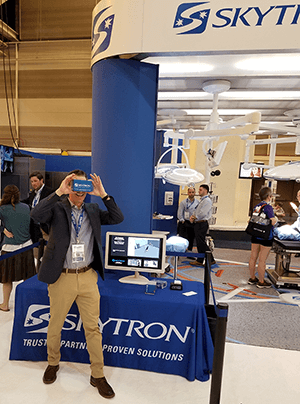 The smartphone VR station, located in the Business Exchange, enables conference attendees to visualize and virtually explore Skytron products in a setting designed for a leading regional healthcare facility. Attendees will receive a Skytron branded Google Cardboard VR headset along with links to experience three layout designs on-site and share with colleagues off-site. "Learn how our visual configuration solution quickly creates unique room designs and simplifies the placement of Skytron products in a near-realistic operating room or hybrid room," said Craig Wassenaar, President at Skytron. "Then explore and validate each environment in virtual reality using your smartphone connected to a Google Cardboard." Powered by Axonom’s Powertrak 3D Product Configurator and VR Design Viewer, Skytron offers a compelling design-to-order experience. These two solutions enable users to configure products and environments in 3D, then explore the room layout and observe product/object spacing using spatial awareness in immersive VR. Wassenaar adds, "Powertrak 3D and VR has revolutionized how we present, educate, and sell our customizable medical products in various healthcare environments." "Skytron's investment in visual configuration software and virtual reality emphasizes its commitment to providing architects, equipment planners, and customers with innovative resources to create high performance, high efficiency settings for acute care facilities," said Mike Belongie, COO at Axonom. Skytron is presenting a Lunch and Learn session "Improving Surgical Outcomes Through Design and Analysis” in the Chastain G & H rooms on Monday, February 19th. Conference attendees will earn CEU credits for learning operating room air system and data innovations that improve efficiencies and patient safety. On Tuesday, February 20th, Skytron is hosting a cocktail event in the Chastain I room from 5:30pm – 7:00pm. This social event gives attendees an opportunity to become familiar with Skytron’s OR Cockpit, and architect and planner website. The OR Cockpit is a real-time safety system for surgery that improves patient safety and process efficiency. This visual management tool helps surgical teams deliver high performance care while reducing surgical site infections and optimizing asset utilization.